Thanks for sharing the recipe for pot pies! You are very welcome! So easy to make, so I always make a few at once! Great recipie! There is a sale on chicken at my grocery this weekend…must do! Three cheers for involved Dads! Woot, woot, woot! How precious to see a father’s heart for his children! We have been grilling this recipe for years and it is sooo good! Either with baked potatoes or rice or sliced on a salad! I use Newman’s own light Caesar dressing- it is delish! I do this with fresh chicken breasts. You can use boneless thighs, though you’ll have to adjust the cooking time. 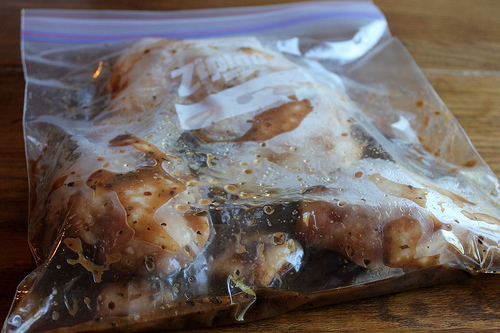 I have done this with other marinades…teriyaki, lemon-rosemary, garlic pepper, etc. 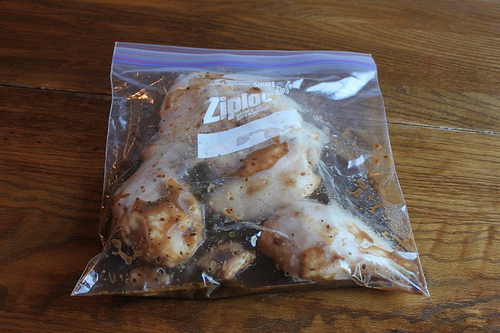 We do something similar… but to make the chicken stretch: after it is done cooking in the slow cooker, shred it and drain the juices. Then add 1 cup chicken broth, 1 can condensed cream of chicken soup (or homemade version), 8oz pkg of softened cream cheese, and some italian seasonings. Return it all to the crockpot and cook on low for another hour. We eat it over rice the first night, then I mix it all up with the leftover rice and some broccoli, put it in a casserole pan, sprinkle some cheese, and bake it the next night. My kids have mixed feelings about when their dad teaches them. My eldest loves it, cause dad rocks at science experiments, whereas mom flops most of them. My middle child hides his writing book because dad corrects too many spelling and grammar errors. My mom made a baked version of this with carrots and canned potatoes when I was growing up. Now I make it in the crockpot with carrots and fresh potatoes. We just had it on Monday, in fact! I was just thinking today that it would be a good “dump” freezer recipe, but I wasn’t sure how the potatoes would hold up if they were frozen raw. I’ve seen freezer-pot-roast recipes call for carrots and potatoes (both raw). I’ve never tried it… but I’m sure they’d be alright. 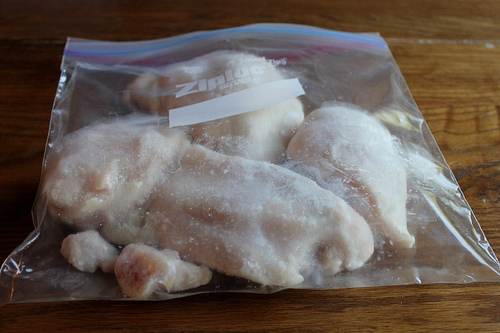 If they aren’t ok when you try it, just boil them for a few minutes before you freeze them. We accidentally discovered we like this with the orange french dressing. I asked my husband to add the dressing to the crockpot, and he grabbed the first bottle he saw. I bought some chicken drumsticks on sale this week, do you think these would work, too? Yes, definitely. You probably wouldn’t need to cook them as long, though. I use this same recipe, except I add 8 oz of cream cheese in the last hour or so of cooking in the crockpot, and its all yummy and creamy. Very delish! Hmm, now that sounds like an interesting twist! I made banana bread and chocolate banana bread today! I was also able to send PB & honey sandwiches with my husband to work from the freezer. He was skeptical at first, but was willing to try it. He said they tasted as if they had been made that morning when it came time to eat them at lunch. This evening, he asked if his sandwiches are in the fridge. 🙂 This will be such a time saver for me each week. I have been making this recipe for a long time. My whole family really likes it and it smells so good when it is cooking. 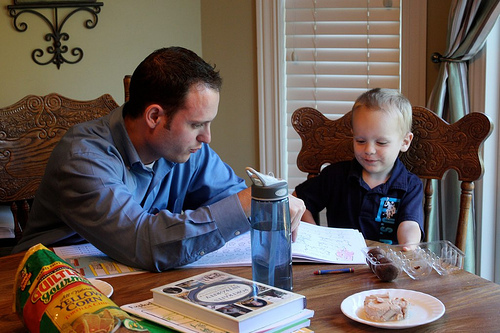 It is great that your husband helps with homeschool subjects. My husband will do Bible study with the kids. Our daughter and him just finished reading the Bible this year. My son loves to have read aloud time with his daddy. I have tons of free (with coupon) salad dressing at home. Thanks! My mom marinated with half Italian dressing, half worcestershire sauce my entire childhood. Great on grilled anything- turkey, chicken, pork, steak, even shrimp. Like daddy, like son! So precious. We make this recipe a lot, and vary the type of dressing. I made homemade marinara sauce in the crockpot yesterday and split pea sausage soup in the crockpot today. Both were dinner and will make plenty to put into the freezer. I was lucky enough to be able to put together a double batch of the pumpkin muffins this afternoon. I have twin 8 month old boys. One napped and the other played in the jumperoo for the first batch. Then they switched for the second batch. This doesn’t happen very often and I took full advantage. The favorite on our house is half italian dressing with half honey mustard dressing/dip. Used a coupon with a Weis sale just this week for the honey mustard sauce. Seeing your husband so involved with your son is simply precious. I teach at a low income public school in NC and so many of my students live with just their mothers and dads are rarely in the picture at all, much less involved. I wish all children could have the benefit of two loving involved parents at home. Thanks for sharing those heart-warming pics of your two best guys! I use the italian dressing, but also add a little La Choy soy sauce & some garlic salt. Yummy! We’ve always done 1/2 italian dressing and 1/2 bbq sauce. We make extra of the sauce and set aside, then brush over the chicken while grilling. Yum! Just had to comment about your hubby and son’s school work. Looks like they are working on a Rod and Staff kindergarten workbook. When my children were small, we used those sweet workbooks, too. 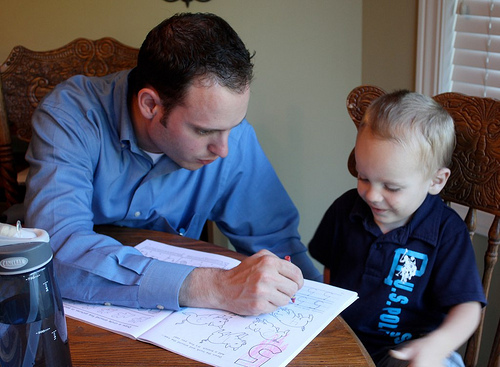 It brings back sweet memories to see your little boy coloring in one! “And He shall turn the hearts of the fathers to the children and the hearts of the children to their fathers.” I encourage you to encourage this. What a blessing. Praise the Lord, may the Lord bless your efforts 100 fold. This is one of my favorites! In fact, it was one of the first chicken recipes I learned in college : ) I’ll have to put some up! Thanks for reminding my Crystal! It’s funny I am making this tonight on the grill, except I marinate mine with the SUN DRIED TOMATOE dressing. We love it! I make enough for dinner and take a peice for my salad at luch the next day. We live on our grill in the summer. Keeps the house cool and the food is just better on the grill. I like the Culinary Treasures Balsamic vinegrette with basil dressing that is sold at Costco. 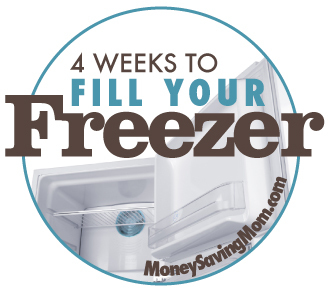 Freezer cooking is the only way to go when you have a busy schedule. Thanks Chrystal for all your advise in this area! Those pictures of your husband and son working together are so sweet. Thanks for sharing. One of my favorites is to marinade with creamy dressing (ranch varieties are our favorite). When the meat has thawed enough to easily separate from the other pieces and the dressing is wet, not frozen, I’ll roll it in crumbs (bread, cracker, or dry cereal of choice) and lay it out on a baking sheet that has been lightly greased. Cover with foil or another pan, then I bake slowly until it is done (this keeps the meat moist and tender. I also add parmesan cheese. We’ve done chicken breasts and buffalo sauce in the slow cooker before. Just shred it and mix with a tiny bit more sauce once it’s done, and then it’s awesome on nachos, in quesadillas, or in taquitos.